Health and fitness expert and best-selling author Brian Keane has teamed up with the UK’s favourite high-street homeware retailer Robert Dyas to create a vigorous ‘housework workout' video which can burn over 700 calories daily and help you to lose up to one pound per week, without going anywhere near a gym. Brian Keane says, “ Housework is a great way to keep fit. There are plenty of opportunities to get a full workout without even leaving your home, with the bonus of a spotlessly clean house at the end of it. But as is the case with any workout, the more elbow grease you put in, the greater the benefit. 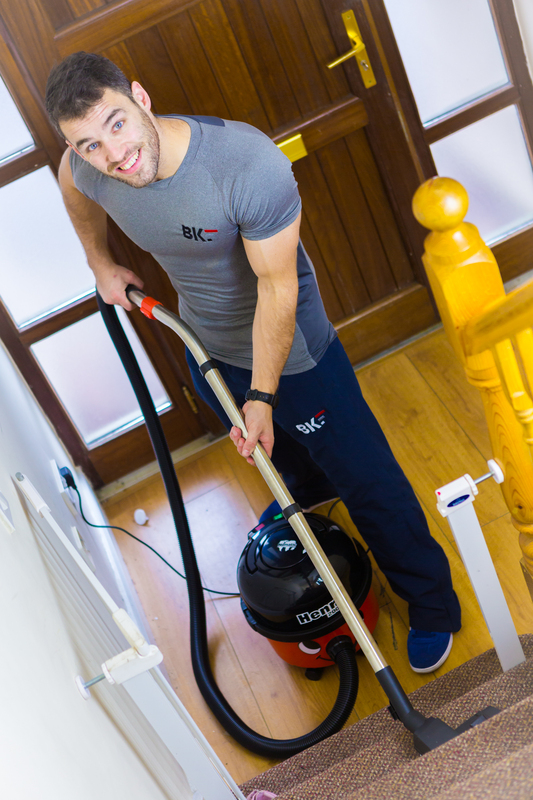 Brian’s full ‘housework workout’ is simple to do, should take you around two hours to complete and will burn over 700 calories which is equivalent to an 8-mile run, with the added afterglow of an immaculate home. This is my personal favourite as it works your upper and lower body at the same time. Go hard and fast with the mop to burn even more calories! Calories burned: Turbo-charged mopping or sweeping can burn around 130 calories in 30 minutes. Exercise equivalent: Sweep or mop for 30 minutes instead of spending 30 minutes on a cross-trainer. Depending on the size of your home, vacuuming can make a dent in your recommended 30 minutes of activity per day. It is great for your legs as the task is performed in a semi squat position plus it works your upper body as you move from left to right. Calories burned: Vacuuming can help you burn 187 calories in 30 minutes. Exercise equivalent: Giving your carpets a good clean for 30 minutes equates to 15 minutes of kickboxing. 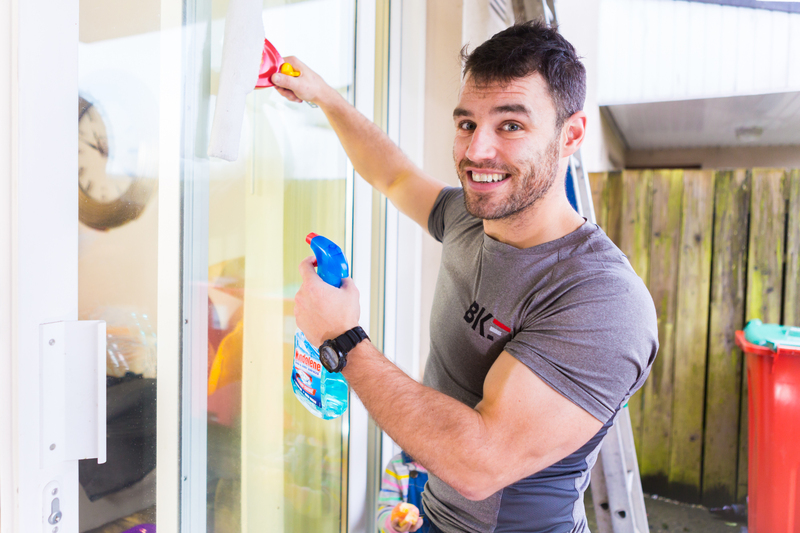 Cleaning windows with enthusiasm and energy gives your upper body and arms an excellent workout. Calories burned: Rigorous window cleaning burns around 168 calories in 30 minutes. Exercise equivalent: Cleaning your windows so that they are bright and clear is the same as doing 40 push-ups or squats. Putting your back into scrubbing the tub is a great way to tone your arms. Calories burned: This chore might only take 15 minutes to complete but you will be rewarded by burning 90 calories and have a shiny bathroom to boot. Exercise equivalent: Cleaning the bathroom for 15 minutes is the same as 30 jumping jacks. Multi-task while burning calories by watching 30 minutes of your favourite TV show or listen to a podcast whilst doing the washing up. Calories burned: Washing the dishes by hand for 30 minutes burns approximately 50 calories. Exercise equivalent: If you spend 15 minutes washing up each day for one week it is the same as swimming 2,500 metres of the pool! Make sure to walk up and down the stairs after each load to shift those extra pounds. Calories burned: Loading laundry from washer to dryer, walking upstairs, folding and organising your washing for 45 minutes will help burn 75 calories. Exercise equivalent: Doing laundry chores for an hour equates to 100 sit-ups! 1. 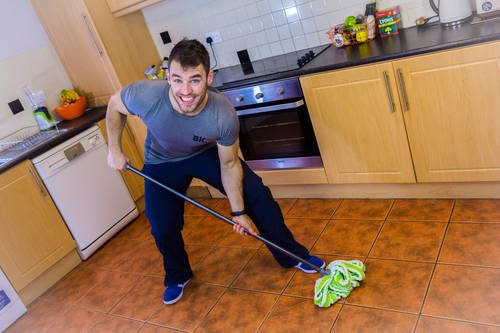 Turn housework into a regular full workout programme. 2. Put the effort in! Do not slow down or take a break. Move swiftly from one chore to the next until your housework programme is complete. 3. Use music (£49.99) to keep you motivated. Plug in your favourite playlist and get moving! 4. Use a wax polish (£11.49) rather than spray. You’ll need to rub much harder to get a good shine on furniture and it will help tone your arms and shoulders faster. 5. Plan your housework so you constantly run up and down the stairs. For example, empty the dishwasher downstairs, then make the bed upstairs followed by vacuuming the living room downstairs and then run upstairs again to clean the bathroom. 6. Keep the laundry basket on the floor. That way you’ll be bending and stretching to reach the clothes. For a more advanced ironing workout and to burn more calories, add 10 body squats every time you put clothes into the basket. 7. Get more creative in the kitchen. Peeling, chopping, stirring, whisking and beating all burn more calories. You’ll find plenty of inspirational gadgets at Robert Dyas. This press release was distributed by ResponseSource Press Release Wire on behalf of Robert Dyas in the following categories: Men's Interest, Health, Leisure & Hobbies, Home & Garden, Women's Interest & Beauty, Sport, Consumer Technology, Retail & Fashion, for more information visit https://pressreleasewire.responsesource.com/about.